Our paper aims to present academic studies, especially in social and human sciences, to the world of science in scientific publishing activities. 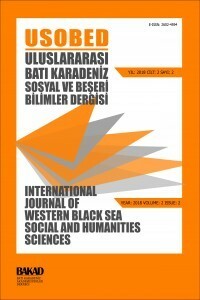 Our paper covers academic studies in political science and public administration, law, sociology, literature, philosophy, history, geography, theology, psychology, economics, business, tourism, art history and archeology and similar branches under the main headings of social and human sciences. In addition, our magazine has the possibility to write articles in Arabic and English languages besides Turkish.